Wonderful North Side MAIN Floor Condo in the North Hampstead Neighborhood! 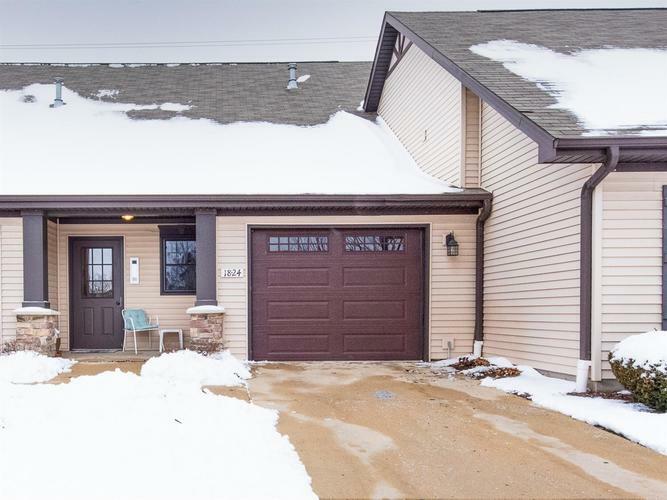 Open Concept, Ranch Unit is handicap Accessible! Enter thru a common hallway shared by 1 other unit. This lovely home has a large Foyer with direct access to your 1 car garage. The Living, Dining, Kitchen areas are Spacious and Open. The Kitchen has a breakfast bar and pantry. The Master Bedroom has attached bath with walk in shower and a walk in closet. The 2nd bedroom located next to the 2nd Bath with Tub/Shower. Laundry room with full size washer/dryer included. The LARGE Dining area has sliding doors to the private patio and back yard. There is an intercom system at the front door for your guests. Your low monthly dues cover exterior maintenance (Roof Included), Mowing and Snow removal. 1440 Sq feet, Maintenance Free, and close to Shopping, Dining and the YMCA. Make your appointment today! Will not last long! Directions:Calumet ave to North Hampstead. Turn right to the condo, on the right.